As I mentioned in my last post, I was interested in embarking on a composting journey of sorts. Well, let me tell you, it has begun and composting at home is fun. Two weeks ago, I picked up a two and a half gallon composting bucket at the Red Hook Community farm. The suggested donation for a bucket of that size is a mere $4.00. They do offer a larger size bucket for a suggested donation of $7.00. Since it is just Jonathan and me, I thought the two and a half gallon bucket would suffice. Transporting my bucket home that day on my bike required just a little bit of improvisation. I thought riding home with the bucket on the bike handle seemed like a likely enough solution, but then the lid fell off and I had to stop mid traffic and pick it up. Then, I decided to stop at the ball fields for lunch and thought it wise to lock up my composting bucket to my bike. Not sure why anyone would want to take such a thing, but then again, I didn’t want to lose that deposit! Once home, I thought about the best possible location for the bucket. Turns out, right outside my back door is the most convenient spot. I just open my back door and there it is. I am lucky enough to have the benefit of an outdoor space in Brooklyn so I think it goes without saying that having an outdoor space to keep your compost bucket makes the most sense. When I told my friends that I was composting at home, most of them replied first with a look of horror which was then followed by “Ooo, isn’t that going to smell.” Well, luckily it doesn’t really smell that bad and it really only smells when I open the lid. What was fun about composting for the first few weeks was figuring out what I could reserve for the bucket while cooking dinner and then feeling a certain amount of accomplishment when I threw in egg shells, corn husks, coffee grounds, and the discarded and unwanted greens. Biking back to the farm proved more of a challenge. Balancing a full bucket on my bike handle was a somewhat terrifying experience, but luckily this time the lid stayed on the whole time. Once I arrived at the farm, I took my bucket to the composting area, and with a little help figured out what to. I added my bucket’s contents to the open tumbler and then added double the amount of sawdust, closed up the tumbler, and proceed to turn the tumbler a few times. 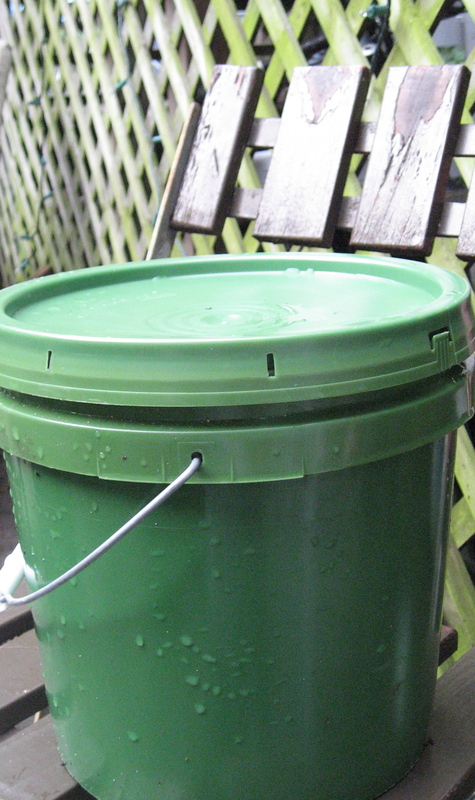 I rinsed out my bucket and brought it home to start the process again. Composting is cause for pausing to think about what I am throwing in the trash and really taking a look at what can go back into the earth. While biking my compost to and fro might not be the best idea, so far so good, and I’m looking to returning to the farm this Saturday. 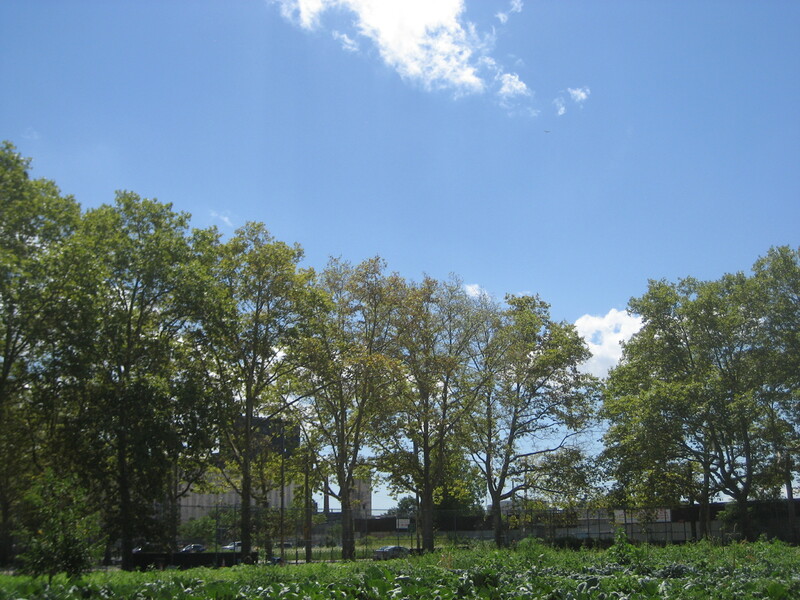 If you are interested in composting and live in or near Red Hook, Brooklyn, you can visit the Red Hook Community Farm to learn more. The farm is open for volunteers who want to help out on Saturdays. Just show up and I’m sure there will be weeding, composting, and not to mention shopping at the farmer’s market. For more on home composting, why not check it out at www.grist.org and www.howtocompost.org. You are currently browsing the Brooklyn Farmer blog archives for September, 2008.